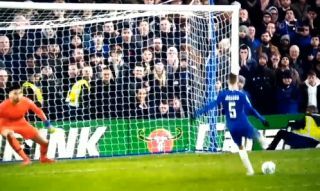 Jorginho got away with a very cheeky little feint before gently rolling home his penalty for Chelsea against Tottenham tonight. The Blues are through to the Carabao Cup final against Manchester City after a narrow victory over Spurs, with Jorginho among the scorers in the shoot-out. The highlight of the penalties has to be this effort from the Italy international, who almost danced his way up to the ball before stroking it past the goalkeeper, whose reaction says it all. Just a great watch, this. Enjoy.